I am extremely curious what foreign readers think of this particular Dutch song. When I first heard it - a friend played it to me because she recorded it from the radio ages before - I couldn't believe this was made by a Dutch band. And what's more, it turned out to be the same band that had recorded 'It takes a muscle to fall in love' that same year. I knew that single, but I'd completely missed this one. 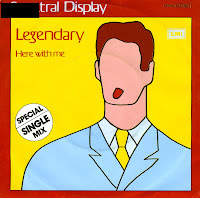 'Legendary' was another single from Spectral Display's second album 'Too much like me'. This single came in a special single mix. The single mix is slightly different from the album version: the beat is stronger and the track sounds a bit brighter. It didn't help the sales, because the single didn't chart in the Netherlands. 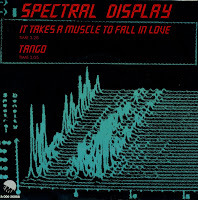 The undeniable innovative sound that was introduced by Spectral Display on their debut single 'It takes a muscle to fall in love' had disappeared when they recorded their second album 'Too much like me'. The band released two singles from this album, of which 'Danceable' was the first. 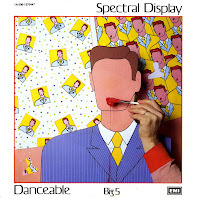 As far as I know, it was the only single by Spectral Display that also appeared on 12" single. And that 12" single contained an extended version of the song. When I bought the single, I didn't really know about this second album. It was advertised in 1983, but since none of the singles reached the charts, I didn't pay attention to them. And so I bought my copy in 2001, not really expecting much. When I bought the 12" single recently, I still didn't expect much. Such is the nature of collectors: sometimes they just buy something because it completes a part of their collection. I can now say that I own all of Spectral Display's tracks. Download: 'Danceable (extended mix)' ; Album 'Too much like me', including the two other tracks. In the early 1980's, synthpop was the flavour of the day. Bands that were starting out didn't need drums, bass and guitars anymore: all they needed was a good synthesizer to make it in the charts. Depeche Mode, Orchestral Manoeuvres in the Dark and Soft Cell were the hottest bands around and their example was followed everywhere. In the Netherlands, Michel Mulders was the synth wizard behind Spectral Display. The single 'It takes a muscle to fall in love' was a striking piece of pop music, which should have been a massive hit. Amazingly, it never reached the Dutch Top 40. 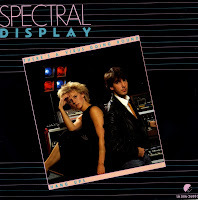 These days, a band would be dropped almost immediately by their record label, but Spectral Display released a handful of singles and two albums before calling it a day. Did I mention that none of these records made the charts?